Continuous auto focus ensures maximum detail on the object under inspection. The fantastic new FLIR T640 Thermal Imager combines the comfortable, ergonomic design of the Flir T-series with the incredible thermal imaging capabilities of the Flir P-series. The 640 x 480 pixel detector resolution provides professional thermographers with the highest thermal resolution and sensitivity on the market for high accuracy temperature measurements up to an impressive 2000°C. This high resolution combined with the dual 5 megapixel digital cameras allow the T640 to offer the sharpest visible light and thermal images required for the comprehensive documentation of a system's thermal condition. The Flir T640 has the flexible ergonomics of the T-series, with a unique rotating optical block that offers 120° range of motion for increased comfort and mobility when acquiring infra red images. In addition the T640 has a built-in colour viewfinder for easier viewing in bright environments. Now also featuring FLIR MSX Technology, the T640 makes is even easier find an identify problems. FLIR MSX Multi-Spectral Dynamic Imaging extracts high-contrast highlights from the camera’s image and then uses FLIRs patented technology to superimpose the enhanced details on the infrared image. This offers enhanced clarity on thermal imagery, providing sharper looking thermal images with more texture. The T640 is a feature rich infrared camera that includes the ground-breaking Wi-Fi Connectivity first seen in the new T-series of cameras. This industry first technology allows the Flir T640 imager to link with mobile devices such as an Apple iPad, iPhone or iPod Touch to speed up analysis, reporting and sharing. Simply download the FLIRViewer App from the Apple Store and you're ready to import thermal images directly from your T-Series camera. Once transferred, you have the option to fine tune your images by adding further measurement spots, adjusting span and level and changing colour palettes to create comprehensive reports that can then be quickly shared via email. 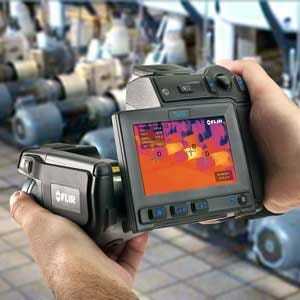 The Wi-Fi capability of the Flir T-series will have a big impact on your efficiency, productivity and credibility. Using FLIR's MeterLink enabled test and measurement devices in conjunction with the Flir T640 you can wirelessly transmit critical data from these devices directly to your camera and use these readings to annotate your thermal images to further support your findings and help to quantify the severity of electrical problems. The new FLIR T640 is a revolutionary IR camera that provides the best thermal resolution in the business for professional thermographers wishing to carry out comprehensive thermal maintenance and inspection of electrical and mechanical systems. This IR camera will ensure that these systems are operating correctly, safely and efficiently. With the new Wi Fi connectivity, detailed thermal reports can be quickly and accurately created on-site and are simple to share with the relevant clients and colleagues. The T640 provides the most innovative way to efficiently capture, analyse and share thermal information. Notably, it now comes supplied with FLIR Tools+ analysis software as standard. Allows users to keep the object under inspection in continuous focus. Allows geographic location data to be added to infrared images. The direction in which the T620 is looking is automatically added to every image. Transfer images and data to mobile devices (iPad or iPhone for example) for fast sharing and analysis of thermal reports. FLIR MeterLink technology allows data transfer from a compatible device (such as the Extech EX845 clamp meter and MO297 moisture meter) onto the T640. The FLIR T640 has a high resolution pixel detector of 640x480 pixels, giving exceptional image quality & detail at longer distances even on smaller objects. The high resolution viewfinder is ideal for outdoor use or when the LCD screen is not used. The Flir T640 is an integrated 5 megapixel digital camera with dual LEDs for generating crisp visual images in all conditions. The T624 merges visual and infrared images to offer better analysis. Include a sketch with the IR image of the inspected object just by drawing it on the touch screen. Focus possibilities include; single shot auto focus, continuous auto focus or manual focus allowing greater flexibility when taking images and ease of use for new users. Super size 4.3” foldable high-quality LCD touchscreen allows you to see the smallest temperature differences and puts thermal analysis at your finger tips. Create visual and infrared non-radiometric MPEG-4 video files. The tiltable IR unit gives you greater flexibilty and allows faster thermal inspection and maintenance work. Easy access to composite video connection, USB and a direct connection to charge the battery inside the camera.